1) You’re a food blogger and can only cram so much in the fridge. 2) You realize you can stop yourself from eating an entire batch of cookies if you freeze them. Then you realize the cookies taste amazing frozen and now you have annoying freezer crumbs everywhere. 3) Your mom taught you to never throw out food. Leftovers are your friend. 4) You are 86 years old. 6) Your nephews are coming to visit for a week! I’m known as Auntie Angie. Or more realistically, The fun girl who looks like mommy and bakes reeeeally yummy Glo Bars. Or perhaps even more realistically, The fun girl who lets us get away with sticky Glo Bar fingers and believes us when we say, ‘Mommy said I could watch one more show before bed’. Mommy, did not say that, but we’ll pretend she did. We can also pretend that this granola is going to last a week and a half in the freezer with Uncle Eric creepin around. He’s a bit of a granola creeper, that guy. I may have to tell him there are beans in it to keep him away. I love granola, but I don’t always love its usual oil and sugar heavy profile. This crunchy lightened up version doesn’t contain any oil and is lightly sweetened, resulting in a light tasting granola perfect for those warmer summer months! I love this granola crumbled over a bowl of Vegan Overnight Oats, a Green Monster, or Raw Buckwheat Breakfast Porridge. 1. 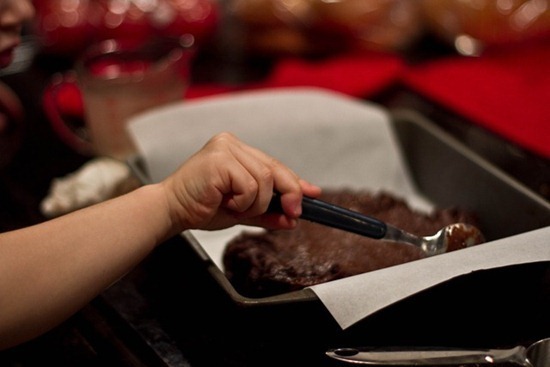 Preheat oven to 325F and line a baking sheet with parchment paper or non-stick mat. 2. In a large bowl, stir together dry ingredients.In a medium sized bowl, mix together the wet ingredients (except for the vanilla beans and extracts). Microwave for about 60 seconds on high. Now stir in the extracts and scraped vanilla beans until combined. 3. Add wet mixture to dry mixture and stir well until everything is coated. Mixture will be a bit dry at first but keep mixing as it will eventually come together! Adjust salt to taste. Scoop onto baking sheet. 4. Bake for 20-25 minutes, stirring once half way through baking. Allow to cool for about 10-15 minutes on the baking sheet. Makes about 5 cups. Store in an air-tight container for 1-2 months. A couple months ago, I sent my nephews a box of this granola as a special treat. Kristi reported back that they gobbled it up and also asked if Auntie could make this for them when they visit! 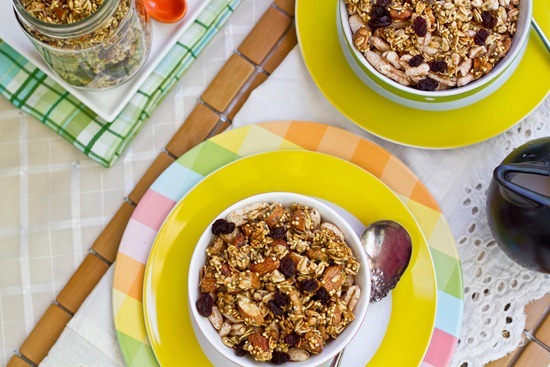 Granola is a great snack to have on hand to mix in cereal, yogurt, or even on its own. I crumbled some granola on top of a bowl of Blueberry Vegan Overnight Oats. A lovely summer breakfast! Now, I just need to hide this from Eric. And myself. Does granola taste good frozen? Don’t answer that. I’m now on the hunt for kid-friendly entree ideas. If you have any suggestions, please leave them below! Now, if you’ll excuse me I have a kiddie pool to set up. Yum! This granola looks great – I can’t believe I’ve never used vanilla beans before!? 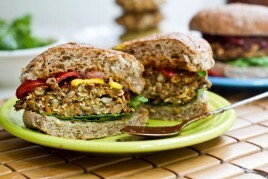 I made your veggie burgers yesterday (delish by the way!) and they’re in my freezer along with some store bought veggie burgers, lots of berries and I have frozen bananas coming out the wahzoo. I’m thinking banana muffins are on the menu this week! Happy Monday. Yummmm! I can attest to this being delicious! I had some of the bag that you gave me yesterday for breakfast this morning and it was SO SO good!! Thinking back to when I was little, mac and cheese was a staple meal. Maybe you can make them vegan mac & cheese? Or build your own pizzas? Happy stockpiling! (Oh and so true about the 86 year old thing.. my grandpa is around that old and I once counted 8 boxes of Raisin Bran and 9 tubs of ice cream!!! His response? “It was on sale!”) LOL! :) Have a great day Ange! LOL…I think your grandpa and I would get along quite well. Oh my gosh, the granola on top of your blueberry VOO looks incredible!! Ahh I always try to freeze things so I dont eat them all but they end up tasting just as good in the freezer, have fun with your nephews!! FINALLY a granola recipe that is actually healthy! It’s so refreshing to see granola that isn’t loaded with sugar and oil! I hoard frozen bananas and frozen fruit. Recently, I froze a whole batch of chocolate zucchini muffins but now I eat those more than the fresh ones because they taste so damn delicious microwaved! That looks just perfect. I have yet to find a really good granola recipe so I’m excited to try this! I have the same issues with my freezer! It is always exploding with food. This summer granola looks wonderful. The official taste testing looks delish! Kid friendly entrees… you can’t go wrong with pizza, nachos or quesadillas, or anything you can dip (maybe a black bean burger done chicken finger-style?). I’ve been craving granola! What would you suggest subbing in for millet? This sounds amazing, I’ve never had a granola with millet in it! I’m definitely guilty of stocking things away in the freezer–especially desserts! My fridge and freezer are always too full to put anything else in! I want to make every one of your recipes ! This granola looks delicious. I have made your Buckwheat groats recipe now 3 times…love ! Freeze your green smoothie into popsicles for your nephews…my kids love them (i add a little more agave than usual) ! My 6 year-old brother loves this pasta sauce (http://www.sweetsaltyspicy.net/2011/03/spiced-veggilicious-pasta-sauce.html). I make it less spicy (skip the red pepper flakes!) when I make it for him. this is the perfect recipe- i always shy away from granola recipes due to their high sugar/oil content. this sounds great! Great post! Love that there is not a lot of oil in this granola! Looks Yummy! Enjoy the time with your nephews! I’m Auntie Katie, otherwise known as the aunt who lives on the other side of the country and has to be really fun to overcompensate for the lack of time and presence. Sigh. 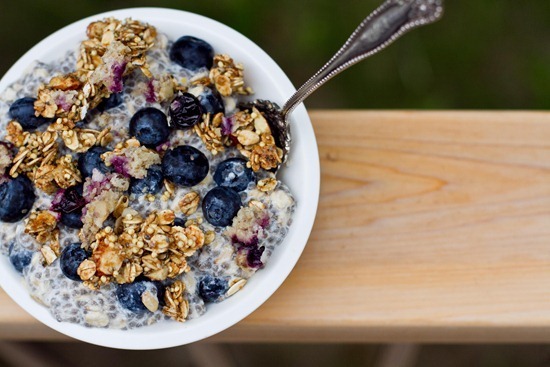 I don’t even like granola, yet these photos may make me change my mind! That looks so so yummy…I may need to try it! I too have a problem with my feezer – I think it’s where my hoarding tendency is best put to good use! have much fun hosting your nephews, angela! with that granola and a kiddie pool (not to mention *a little* spoiling from auntie and uncle!) they will never want to go home! Haha, this makes me feel better about leaving my husband food in the fridge when I travel for work. Sometimes I feel like it’s 1950 or something b/c I’m always thinking a few days before I leave what I can make that produces leftovers that keep well for him. I’m intrigued by the millet in this granola. Sounds interesting! Thanks for the recipe. I like the applesauce touch, I’m excited to try it. I have started using Coconut Sugar instead of Sucanat because it’s supposed to have lower GI level and overall better for you. 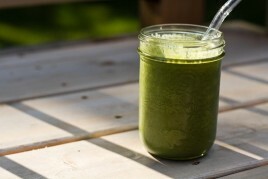 I also wanted to recommend the website www.greensmoothiegirl.com I think you would find her information really interesting. Thanks for all your delicious recipes. If you felt so inspired to share any kid friendly entrees you might think of in the future, they would be greatly appreciated!!! Thank you! I love your polka dotted apron! I’ve been looking everywhere for one! I love your dishes and color combination! So beautiful :) Thanks for sharing that great recipe… can’t wait to try it! Oh Auntie Angie this looks so good! I agree that frozen treats are even better, so the freezer is not a “safe place” for me to keep treats. I end up eating too many and then I don’t have any to enjoy the next day! I love granola! I just made maple syrup & brown sugar granola bars (not super healthy, but so delicious) that my fiancee and I have been nibbling on for about a week. This granola sounds perfect! I love that it’s oil free and low sugar. Will be making it right away! Such a great idea! 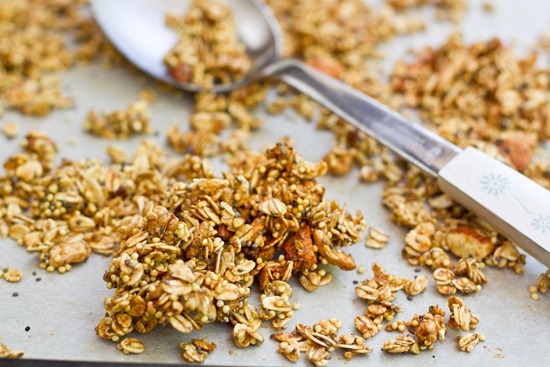 I love the idea of an oil-free granola, to have a lighter version on hand. I love to stockpile our freezer with garden-fresh goodies. Right now we have some pesto from this year’s herbs, plus some of last year’s jam. Soon there will be lots of jam in the freezer, and I often freeze extra muffins or cookies when I make too many. You have given me so many recipes I want to try and make to take on our beach vacation. I have a newly pregnant DIl who is having a hard time finding things healthy enough to eat and sit well on her stomach. Everything you’ve posted lately looks like it will fill the bill! I had really great success with doing grilled stuffed bananas. I varied the recipe by adding coconut and removing marshmallows, and it was a big hit! I retrieved the original idea from here: http://www.wholefoodsmarket.com/recipes/2564 , It’s a lot of fun to stuff the bananas with goodies! i wish you were my aunt!! lol they will be well fed i’m sure of it! Frozen cookies are amazing! Have fun with the kiddos! 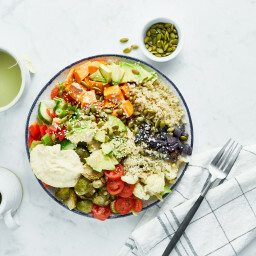 This looks so delicious! When I teach my Thrive classes, I always make a batch of granola to show how simple it is, plus the house smells amazing. I’m going to try your recipe changes to make it healthier – I’m sure my students will be happy that it is lower calorie. So excited to try this granola! I have Blueberry Vegan Overnight Oats planned for Wednesday mornings breakfast, and this will be perfect to put on top :) Thanks Angela! And…Blueberry Chia Breakfast Squares?! 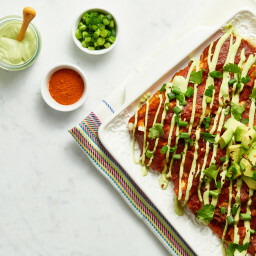 Is there a recipe that goes along with those? How about grilling out one night and have sliders and smores. Also make your own pizzas, spaghetti, tacos, pigs in a blanket. Raw veggies dipped in Ranch dressing. I bet you are a fun Aunt! Any aunt who bakes delicious granola is a winner. I’m sure the kids love you. Have fun with your family! And you can’t blame Eric…I’d probably be stealing all the granola too! Even if it really did have beans in it. haha I used to LOVE going to my Aunt’s house. She’d let me drive, listen to awesome music, and eat junk food all day. I’m sure there were a bunch of veggies mixed in there, but I only remember the chocolate and candies. I’ve put millet in my granola before and I found it way too crunchy! So, I soak the granola overnight and the grains get all soft and chewy. SO good! I just took my ‘little sister’ from the Big Brothers Big Sisters program to the Children’s Health Education Center and she tried granola for the first time. (She’s eight). She loved it! I was so proud of her for trying the cucumbers and tomatoes as well. (Those she didn’t like so much, but she tried them!). This recipe is great. Next time we get together I’ll have her make it with me. That way she’ll have a “go-to” healthy snack. Aww that’s so sweet. :) Thanks for sharing Kelley! Have a fun time with your nephews!! Great recipe. You use the same trick I do to lighten up granola: applesauce! Aww glad it was enjoyed! I will check out that recipe..thanks! Angela – I make granola using ground up dried plums (prunes) instead of honey/syrup to sweeten and bind the granola… Sometimes I add an egg as well to help bind everything (Would a Flax egg work – Maybe? )… I pack everything into a large rectangular cake pan and bake it until it starts to brown… Then cool, then break it up on a cookie sheet so you get those nice “clumps”… Then bake again until the pieces are golden brown and crispy. I started using the plums when I was on the Wild Rose Cleanse a few years ago and kept using the recipe because – Well – It’s delicious! Anyway, I thought maybe you’d want to experiment… Love your blog! This batch I made actually clumped quite well! The photos were from the first batch I made 2 months ago, but this batch actually formed into one huge pan sized layer and then I had to break it up. I love it clumpy too! I will have to try it with dried plums! Hi!! Thanks so much for all the yummy recipes- granola is my absolute favorite. I was wondering if you have ever tried raw hulless oat groats?? I was reading about it in ani phyo’s raw food essentials book and wondering if you had any experience with them?? Been waiting for a good light granola recipe for a long time – and your recipes always turn out perfectly! Thank you! You sound like such a cool aunt. :) The kids must love you. I can’t wait to make this granola! It looks so good. oh, PS – what can I sub for millet??? quinoa, maybe? YOM! I am all for lighter foods right now…this sounds so good! I just popped this recipe in the oven! Can’t wait! Oh what trouble I’d be in if I had an extra freezer like so many friends. I swear one day I’m going to not go to the store for anything other than produce until the freezer and pantry have been depleted! Your nephews will love whatever delicious concotions you decide to make! Have lots of fun, kids are adorable. Ahhhh love!!! And girl. By the way. You have seriously gorgeous hair. Just sayin. Thank you so much Angela! I’ve been looking for a recipe for lower cal granola that doesn’t lose all of the flavor. And thanks for letting us know what’s in your freezer! Gonna make those veg burgers in bulk and freeze the patties like you! Haha… energy pills = kale? Always love a new granola recipe! I get so excited when Millet is involved. It gives that perfect crunch! Your pictures are always sooo pretty! Even if i hated granola (which i clearly dont) i would want to eat your breakfast everyday! Kid Friendly Entree – Anything they can help with! Having worked and volunteered with kids for as long as I can remember, this is the best way to get them to enjoy what they are eating. My favorite go to – Make your own Pizza. My brother and I would beg for this night as kids. So much fun to use pitas, tortillas or homemade crust. Boys can “build” their pizza. Girls can “decorate”. I still love making pizza. Your granola looks so YUMMY! My hubby and kiddos LOVE granola…and I too have a favorite granola recipe that I’ve been wanting to “lighten up”. You’ve inspired me to get in the kitchen and start tweaking it! :) Love your site!! 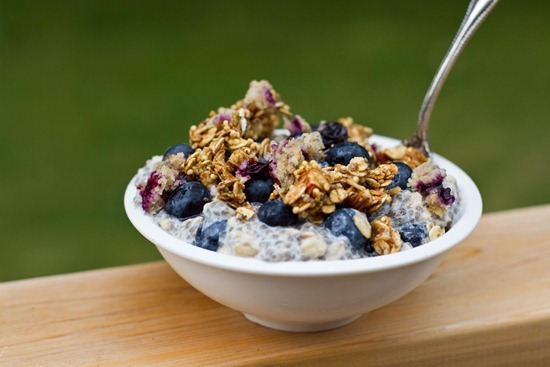 Those blueberry overnight oats look GREAT! I love the looks of your granola…but your opening lines are CLASSIC!!! Girl. I have a FREEZER FULL of desserts and treats. People are like well do you eat everything you make? What do you do with it all? I always try to have a tasty treat stashed in my freezer. I’ve never thought to freeze granola before though. Does it stay crispy? Mmmmm! That looks good! That’s my style of granola and it looks particularly appetizing on the VOO! Our freezers must look a lot alike–I tried to prevent myself from eating raisins (weird craving, right? but I LOVE raisins!) by freezing them–but now I think cold raisins are even BETTER! noooo! Awww! Haha, you’re a great aunt! That’s what’s great about us aunts–we get to allow them this and that, but we don’t have to deal with the repercussions later :P Your overnight oats always look sooo good! Being an aunt is one of the best things I’ve experienced in life so far! Oh, i’m definitely making that. my freezer is stuffed with loaf breads pre-sliced, cookies, raw cookie dough balls (your version), and sometimes soups too! 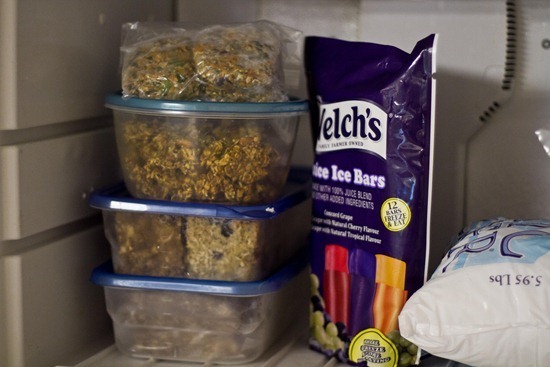 I always talk about using my freezer for more than just ice cream! I was thinking of buying some granola this weekend, no need to now I can make my own! I laughed so hard at #2! I made Mama Pea’s doughballs the other day, threw them in the freezer, forgot about them, re-discovered them last night, and today? They’re gone. Oops? Homemade granola is the best! This looks awesome. I love your original granola recipe, so I’m sure this is just as good! I’ll have to make it once my current granola stash runs out. I love you for this. 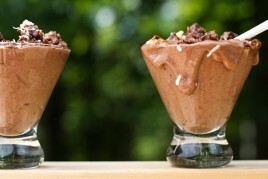 There are three little boy guests in my house this week and I really want to make them healthy treats. I have a feeling the Mac n Cheez would go other big time. And as for this granola, I’m making it just for me!! It is awesome to have a lightened up version to satisfy my inner granola monster. I pretty much want to live in your freezer. I love your photos and recipe creations so much! Very inspiring Angela – thanks! This looks so yummy! I love homemade granola. Such a perfect treat! This is the answer to my prayers Angela! I adore granola but banned myself from making or buying it as I scoff it in no time and as you say it’s packed with sugar and fat. for kids: tacos, pasta, homemade soup, poached egg sandwiches, lasagna. y niece eats just about anything, but I’ve never met a kid who doesn’t love tacos. Or chicken fingers for that matter. I’m not one to leave comments on a blog, but I just say how much I LOVE your blog…and every single one of the recipes you post. Your pictures are also fantastic….so colorful. They make your food look irresistible. I’ve only tried one of your recipes (apple cookies), and they were delish! I can’t wait to try more. Thanks so much!!! Great minds think alike! I just posted a granola recipe, lower in fat & sugar, on Monday! Your recipe sounds super tasty! Just made a batch of your granola recipe! It’s delicious. The millet gives it a perfect crunch! Not too sweet, just salty enough. Very very good! It will be enjoyed by all my family for sure! I made this granola last night and had it for breakfast this morning. Wow! Best granola ever!!! I love the crunch of the millet. I skipped the sucanat and put in 3 drops of stevia with the vanilla and almond flavour instead. I also used half agave and half honey as liquid sweeteners. Yum! yum, yum,,,it smells heavenly(in the oven right now),, made your other granolas and their awesome too! Used buckwheat(on hand) added cocnut(<3) and some homemade apple butter with the apple sauce, walnuts(again on hand)…lucky, lucky nephews…enjoy your visit. I love those Welch’s freezies! They’ve been a staple in my freezer all summer. 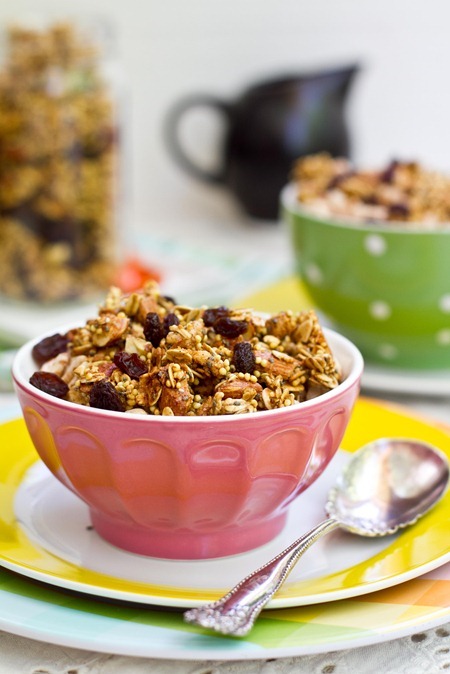 Love the idea of lightened up granola! Have you seen Maria’s (Two Peas and their Pod) pumpkin granola. Very little oil–she uses pumpkin and apple sauce instead! Delicious! Hi! I don’t have applesauce cuz I always buy it for recipes and then it gets moldy before I can finish it so I end up wasting money…could I use (cow’s) yogurt instead? I don’t have pumpkin either…or maybe just a few tablespoons of water to moisten it up? This looks great! I think I even have all the ingredients (minus vanilla bean)…. 1) What is millet? And is there a substitute? 2) What kind of apple sauce do you buy? I buy PC applesauce, unsweetened. 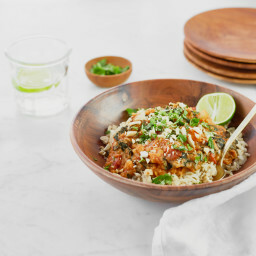 Loving this recipe, also the bowls. Where are they from? crate and barrel I think? Oh my goodness, THANK YOU for this recipe! I never buy granola anymore because it’s so expensive – and loaded with oil and fat, and I’m trying to clean up my diet. 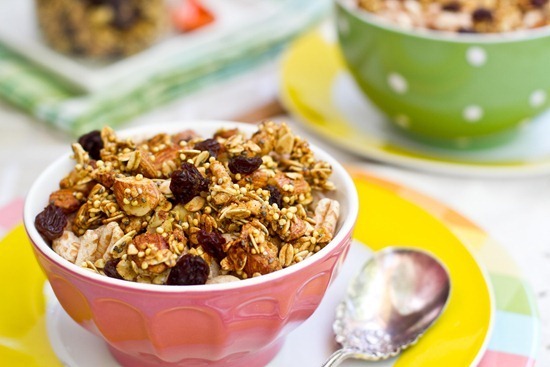 This is officially the perfect granola recipe! I just made a batch and split it up into mason jars – one for the nurse at the school I work in (for Nurse’s Day on Wednesday) and one for my Mom for Mother’s Day. They will both love it! I only wish I made a double batch so I could have some for myself. :) Oh well, I’ll just have to make it again! Glad you enjoyed it Lauren! Hi there — me again! I made this recipe this morning for the kids, and it was delicious! I love the crunch of the millet. I added some coconut flakes to the dry ingredients, and they browned beautifully. The whole tray was gone before I left the house at 8:30am! Can’t wait to try another one tonight! I don’t know how many times I’ve made this recipe, and I swear it comes out better every time!! Thank you so much! So happy to hear that Alyson. This is the best ganola recipe of all time. Thank you so much! I had been searching far and wide and nothing even came close to this recipe. I have been using agave syrup instead of brown rice, but just because I had it on hand. I think brown rice syrup will taste better. Also I used maple sugar instead of succant. It’s a fantastic substitution. It really works well with the cinnamon and applesauce. Sometimes I add in some hazlenuts in addition to the almonds. I don’t have almond butter, so I use peanut butter (natural). 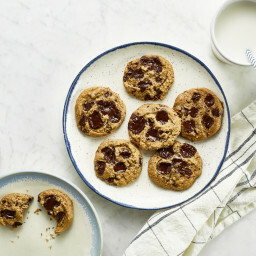 Lastly, I throw in a handful of mini dark chocolate chips!!! I make this every weekend and eat for breakfast throughout the week. it’s healthy and satisfying. I tried this recipe, but halved the portions because I didnt have enough rolled oats left. However I forgot to half the baking time! hahahaha but its okay, I took them out at 15 mins and although the batch is a little crunchy, it tastes great and I’m proud to call it mine. Everyone should try this as soon as they can! I have made this four times now. It is so delicious. I experimented with different flavors. I made an almond one by adding more almond extract (probably 1 tbsp or more). I made a pumpkin one by substituting the applesauce for pumpkin. I also tried making one without the brown sugar, but it came out very plain. I added more cinnamon, nutmeg, dried apples and raisins in hopes of brightening it up a little. It still seems bland. I do think that the sugar is an important factor in this recipe. This granola is UNBELIEVABLY good! I have made it twice and love it. Question: do you think I could substitute couscous (not the pearled kind, but the tight little grains) for millet? They are about the same size, and since they mostly provide crunch (I think?) it seems like it should work . . . ? Hey Natalie, I don’t think I’ve ever used it in a baking recipe before, so I’m not entirely sure. Please report back if you try it! Just made the granola tonight and added dried cherries and it was amazing! Any chance you have a calorie count per serving? Just made this granola and it is INSANELY good. So light and delicious. Added twice and much applesauce and I’m such a fan. I love this granola. I have made this over and over again since you first shared this recipe. It never lasts very long. And the children are always disappointed when it is gone (and plead with me to make more). I can also report this works brilliantly with sunflower seeds in place of the almonds and homemade sunny butter in place of the nut butter. This is, hands down, my favorite granola. I love it because it’s a clumpy, crunchy granola that is not nut-heavy – I love nuts, but my husband is allergic to them, and even before we were married I used nuts sparingly because they are so expensive! 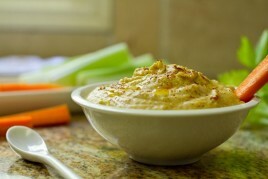 This works wonderfully with sunflower seeds and sunbutter instead – the flavor is different, but it’s still delicious. Hi Lilian, I’m glad you like the Summer Granola, and am SO intrigued by your Winter version! It sounds delish – I’ll have to give it a try. :) Thanks for sharing! This is a super tasty granola and it has a great texture to boot, thank you! 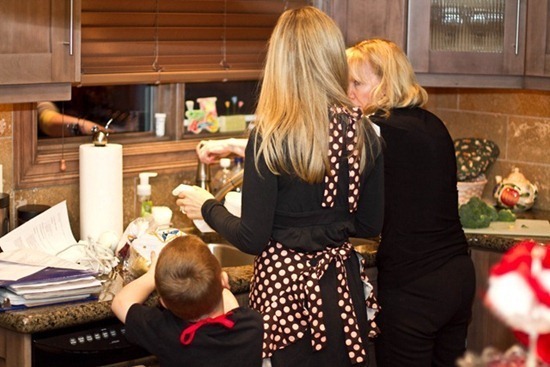 My family and I really appreciate all your amazing recipes! I’m just sorry it took me so long to get around to trying. :- / Better late than never right? So right, Deb! :) I’m glad you enjoyed the granola bars, and I hope you love whatever you try next, too! Awesome recipe again! Thanks so much for this. I have two questions here though, 1) I don’t use microwaves, what’s the alternative 2) and for liquid sweetner can I use Honey?